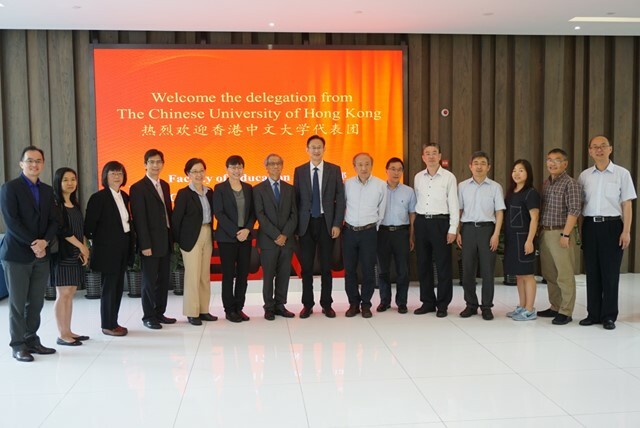 The delegation from the College of Education, CUHK, the Chinese University of Hong Kong, visited the Faculty of Education, ECNU, on the morning of May 17th, 2018. 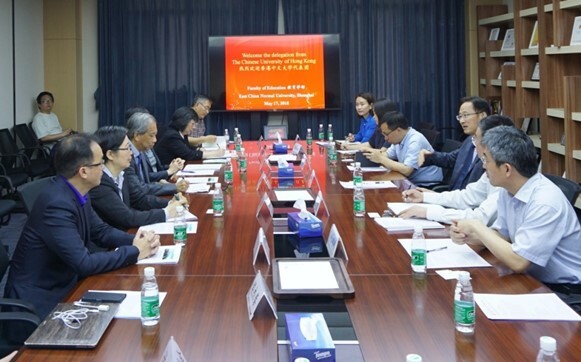 This meeting aimed at promoting the exchanges and cooperation in the higher education field between the Mainland and Hong Kong. Following the participants whom attended the meeting: Prof. Liang Xiangming, Dean of the College of Education, CUHK; Prof. Xia Xiuzhen, Deputy Director of the College of Education, CUHK; Prof. Ni yujing, Deputy Director of the College of Education, CUHK; Prof. Zhang Zhiqiang, Director of the Department of Education Administration and Politics, CUHK; Prof. Huang Yunzhi, Director of the Department of Educational Psychology, CUHK; Prof. Hou Jietai, Prof. Cai Jingxin, Prof. Liu Jieling, Prof. Xu Shiquan and Director Liu Jingxi also presented. Prof. Yuan Zhenguo, Dean of the Faculty of Education, ECNU; Prof. Zhou Bin, Director of the College of Teacher Education; Prof. Li Weisheng, Director of the Department of Education Management; Prof. Yang Xiangdong, Director of the Department of Educational Psychology; Associate Prof. Zhou Wenye, from the Department of Curriculum & Instruction; Hu Yuman, from the International Affairs Division, Faculty of ECNU, and Zhang Ping, Deputy Director of the International Exchange Division of ECNU also attended the meeting. 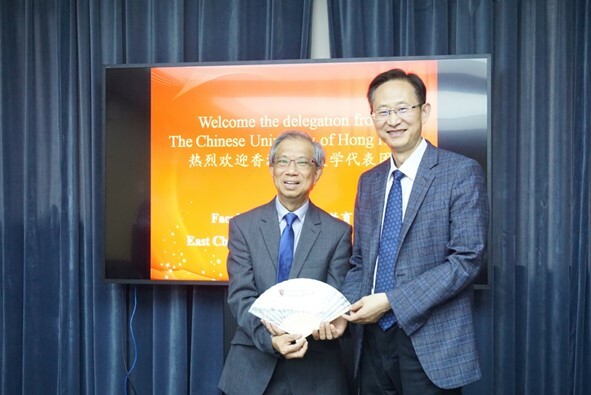 Before the official meeting, Prof. Liang Xiangming was invited to deliver a speech titled “Based on the Tradition, Towards a Bright Future—The Development, Adjustment, and Opportunities Faced by the College of Education, CUHK”. He introduced the history, staff management, and course setting of CUHK. 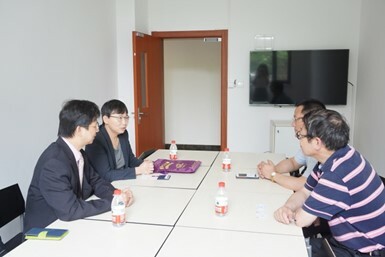 He also insisted that the current situation called for much attention to be paid to improving teacher’s creativity, teaching technology application and teachers’ role in students’ lifelong development. The student-center paradigm and the transformation of learning space in the future should also be emphasized. 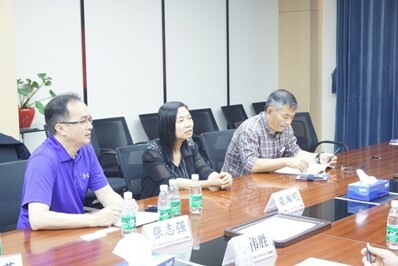 The speech was hosted by Prof. Zhou Bin. After the speech, both sides had a heated discussion on various aspects, such as the reward mechanism and the research support for teachers. 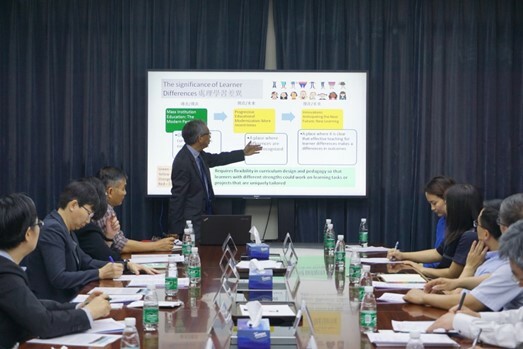 During the official meeting, Prof. Yuan Zhenguo introduced several measures that have been implemented recently for the purpose of promoting internationalization. These consisted of: “the Academic-Exchange Week”, the Forum for Directors of the College of Education Around the World, the English Journal and so on. He also emphasized that the development strategy of ECNU focus on internationalization, informatization, and cross-discipline education. 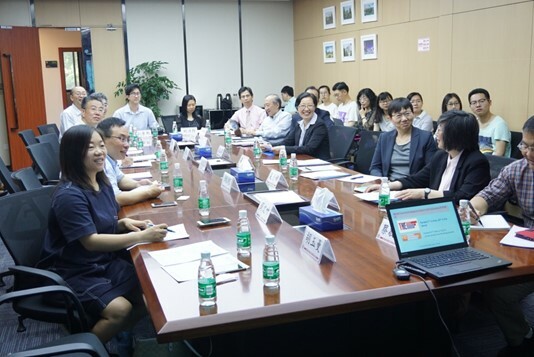 Prof. Ni Yujing and Prof. Xia Xiuzhen also introduced the programs that were established at CUHK to enhance the cooperation with other universities, such as the “China Link”. Both sides extended their best wishes for deep and further communication. 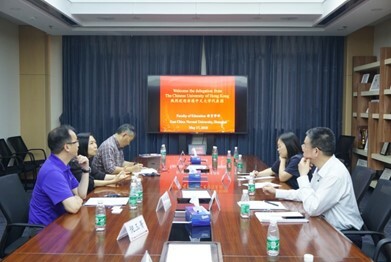 Later, the delegation of CUHK was divided into several groups in terms of their research fields and had warm discussions within each group.